Bienvenue à Beechwood Animal Hospital! Beechwood Animal Hospital has been located in Vanier, Ottawa since 1996, serving the community and surrounding areas. Welcome to Beechwood Animal Hospital! We care about the health of your furry family members. Our focus is dogs, cats, rabbits and pocket pets, and the wellness of your pets throughout their lives. We offer special additional services such as Export Preparation, Companion Class IV Therapeutic Laser Therapy We also have developed programs to facilitate dental care, and age specific wellness programs. (puppy and kitten to geriatric) . We are currently accepting new clients and patients, and are always grateful for any of your kind referrals. 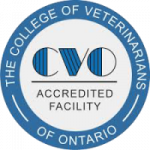 Beechwood Animal Hospital is committed to excellence in serving all customers including people with disabilities, and meet the Accessibility Standards for Customer Service Ontario Regulations. This website is regularly updated and monitored by our staff. The ‘client education articles’ and ‘news’ sections, among other areas, are both being added to, updated and modified by our veterinary specific internet provider. Please feel free to give us a call, or email us with any questions, concerns, or to book an appointment for your beloved furry friend today. 613-748-9820. From puppy and kitten through adolescence, adulthood and into their senior years, we team with you to help maintain optimum health of your furry family member throughout their lives. Continuing with annual exams, vaccines, wellness bloodwork, parasite prevention, nutrition, dental care and more we aim to address any unforeseen health issues as they arise and implement the best treatment plan for you. If your pet needs medical assistance, you can feel confident turning to us. We advise at least a yearly physical examination to help detect any potential health problems with your pet. We offer many options to help keep your pet’s teeth clean and gums healthy. A full dental scheduled approximately every 18 months may be required. Our experienced veterinarians provide many surgical services at our clinic, ranging from routine to advanced procedures, and including elective, soft tissue and have access to Board Certified Surgical Specialists for non-routine procedures. To provide thorough, thoughtful, and tailored veterinary services for all animals entrusted to our care, with an emphasis on patient safety, comfort and well-being; as well as maintaining on average costs within 85% OVMA guidelines. To communicate with our clients in a clear, concise, and respectful manner; to listen to concerns, and prioritize diagnostic and treatment options in a sincere and compassionate manner.